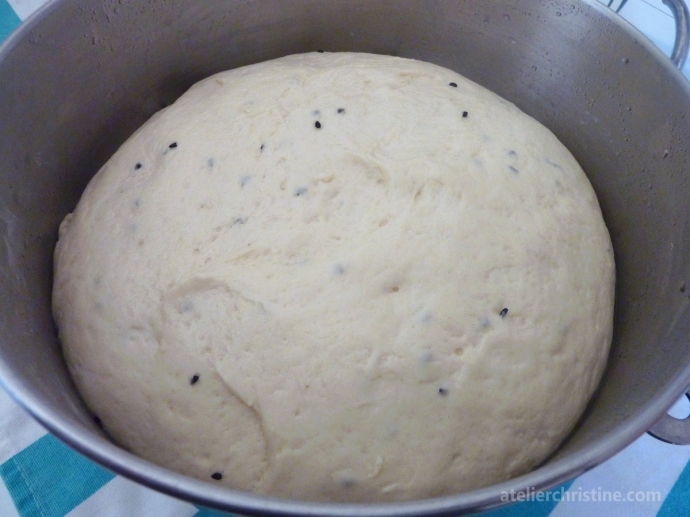 To prepare dough, whisk together flour, salt, baking powder, mahlab and black caraway seeds then set aside until ready to use. Mahlab (mahlepi) is a baking spice made with the dried kernels of St Lucie’s cherries and can be found in Greek or Middle Eastern Markets. It is widely used in breads, pastries, cookies, cheese and milk puddings; it adds a unique sweet floral flavor – tastes a bit like cherries, a bit like roses, and a bit like almonds – but has to be used sparingly because too much of it turns your pastry slightly bitter. Try to buy whole kernels instead of ground and grind them yourself as needed. Start working on the dough as instructed in the recipe below; I used a stand mixer with the paddle attachment to start off with then switched to the dough hook. 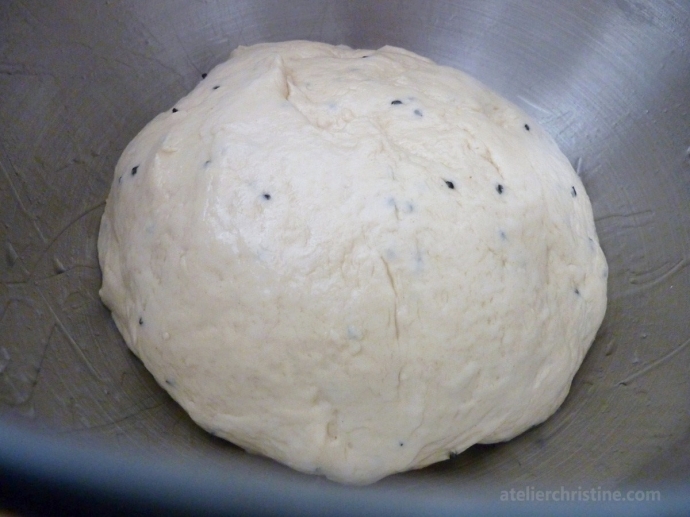 Knead to a non-sticky, medium-soft dough. Form into a ball, grease with a little bit of oil then cover with a damp cloth; set aside 40-to-90 minutes until doubled. 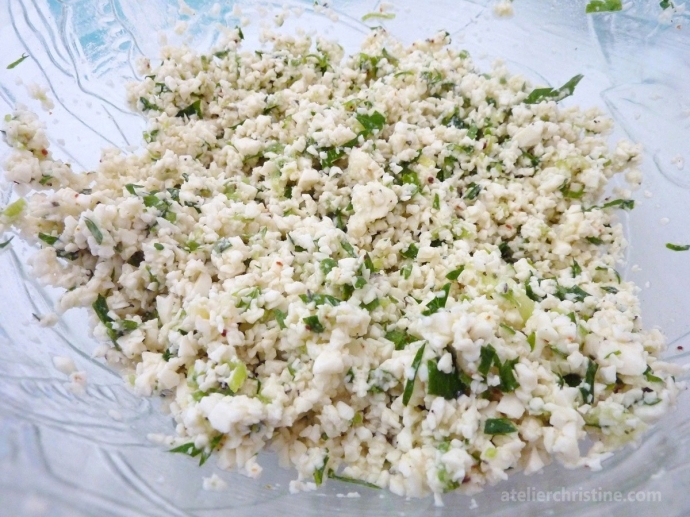 Meanwhile prepare cheese filling and egg wash. If the brand of cheese that you are using is salty, as is the case sometimes with Nabulsi and Jibneh Mshallaleh, then wash in several changes of cold water to reduce the amount of salt and drain thoroughly on paper towels before use. Aleppo pepper, also known as Halaby Biber, is crushed moderately hot sun-dried red chilies. If you cannot find it in your area use a combination of 4 parts sweet paprika and 1 part cayenne pepper. Once dough is ready to use, transfer onto a clean working surface barely dusted with flour and divide into quarters. Further divide each quarter into eight pieces; you should have a total of 32 pieces. Pinch the ends of each piece at the bottom to form balls. Cover loosely with plastic wrap and set aside 10-to-15 minutes. 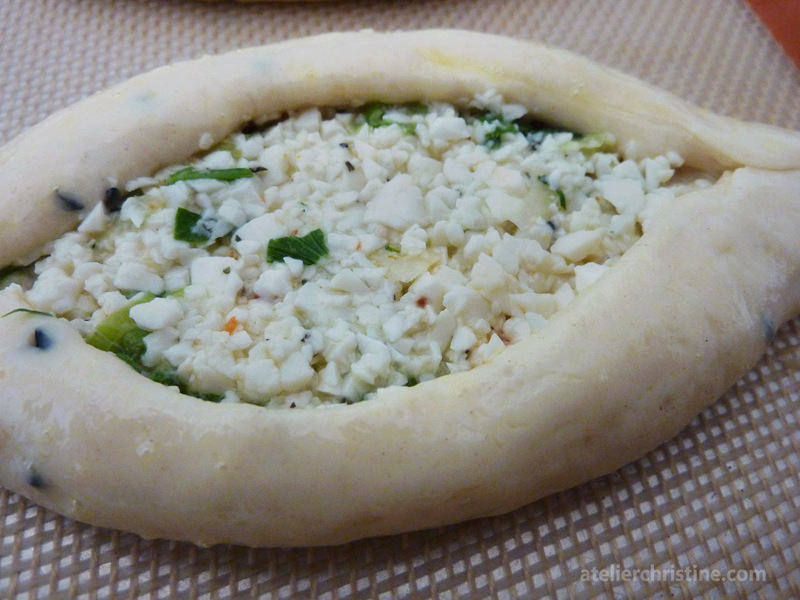 Work with one dough ball at a time and flatten each into a 5”x3.5” oval shape. 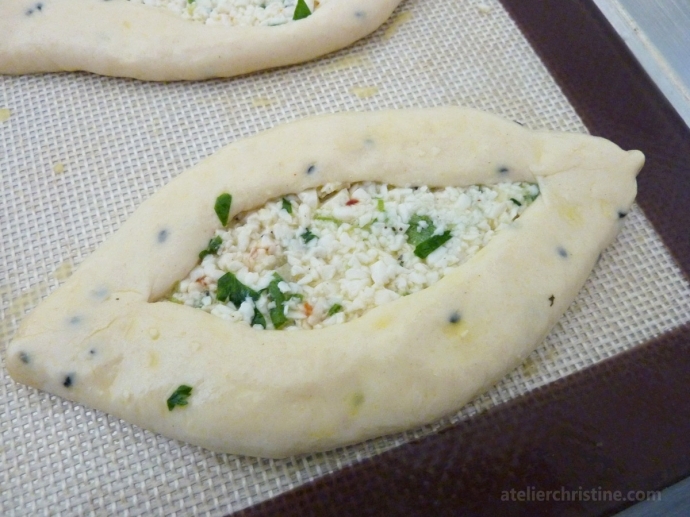 Evenly spread about a heaped tablespoon cheese mixture over dough; leaving a 1/2”-to-3/4” border. Fold the long sides over filling and pinch ends tightly to seal; creating a boat-like shape. Transfer onto a baking sheet covered with parchment paper or silpat. Cover with a piece of wax paper and slightly press to flatten edges; your assembled pastry should be about 5”x2 1/4” in size. Repeat until all pieces are shaped. Lightly brush with egg wash and set aside 20-to-25 minutes. Bake in a preheated 385F oven for about 15 minutes until slightly golden. Serve warm or at room temperature. Prepare dough. 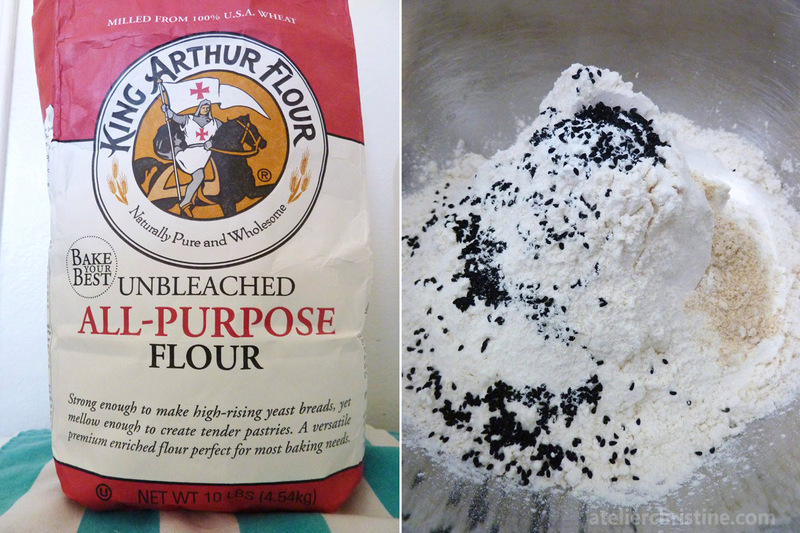 In a bowl, whisk together flour, salt, baking powder, mahlab and black caraway seeds; set aside. Add water into your mixer bowl and whisk in yeast and sugar until dissolved; let proof 10-to-15 minutes until bubbly. To the same bowl add yoghurt, olive oil, safflower oil and about ½ cup milk; mix on low to combine. Gradually incorporate the flour mixture as you mix on low using the paddle attachment; adding the rest of the milk towards the end as needed. 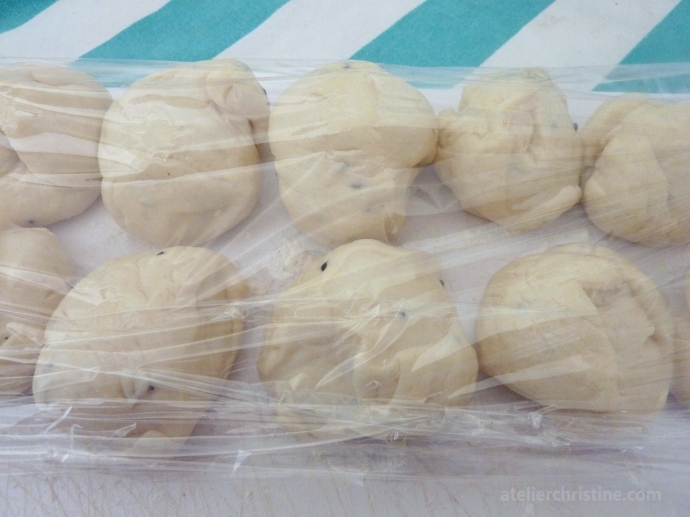 Switch to the dough hook and knead to a non-sticky, medium-soft dough. Form into a ball, grease with a little bit of oil then cover with a damp cloth; set aside 40-to-90 minutes until doubled. Prepare filling. Process cheese in a food processor, crumble or dice until it resembles coarse breadcrumbs; do this before you measure into cups. 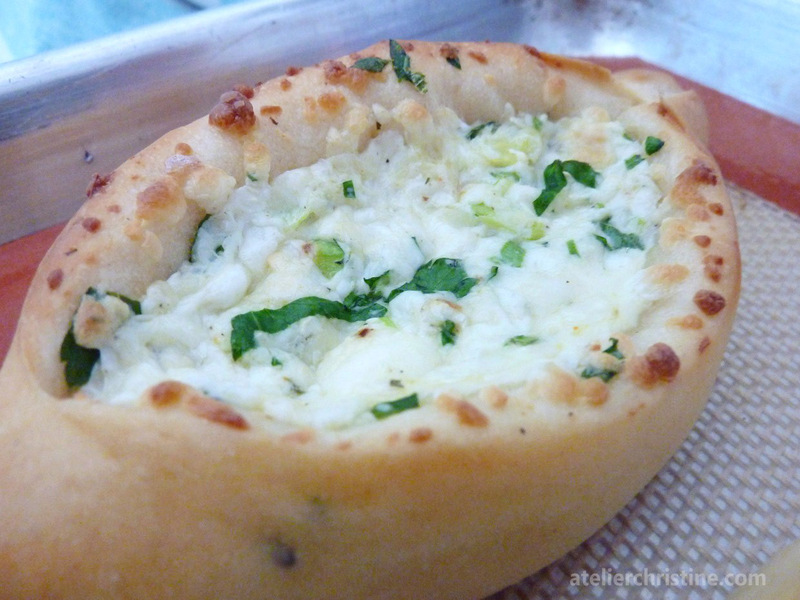 Blend all three cheeses together with remaining filling ingredients; set aside until ready to use. Prepare egg wash. Combine egg yolks, water and lemon juice in a bowl and whisk to blend. Assemble pastry. Transfer dough onto a clean working surface barely dusted with flour and divide into quarters. Further divide each quarter into eight pieces; you should have a total of 32 pieces. Pinch the ends of each piece at the bottom to form balls. Cover loosely with plastic wrap and set aside 10-to-15 minutes. Work with one dough ball at a time and flatten each into a 5”x3.5” oval shape. 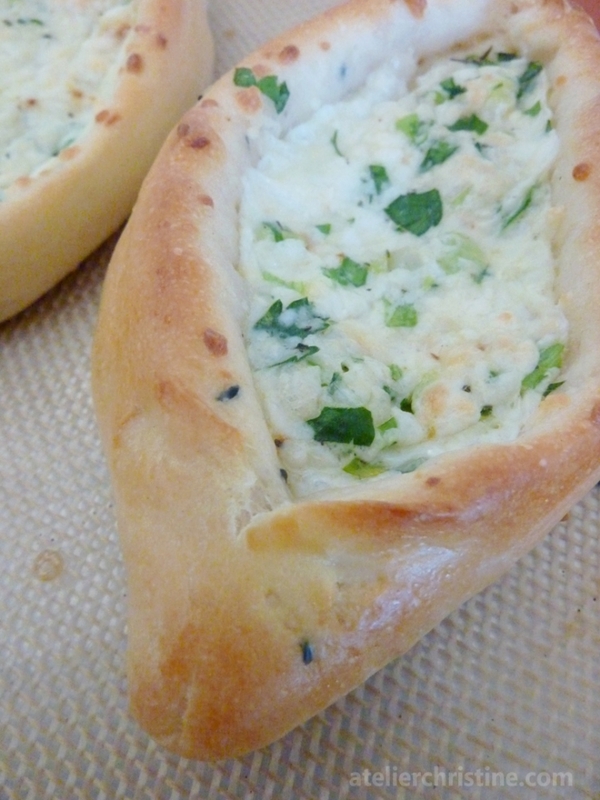 Evenly spread about a heaped tablespoon cheese mixture over dough; leaving a 1/2”-to-3/4” border. 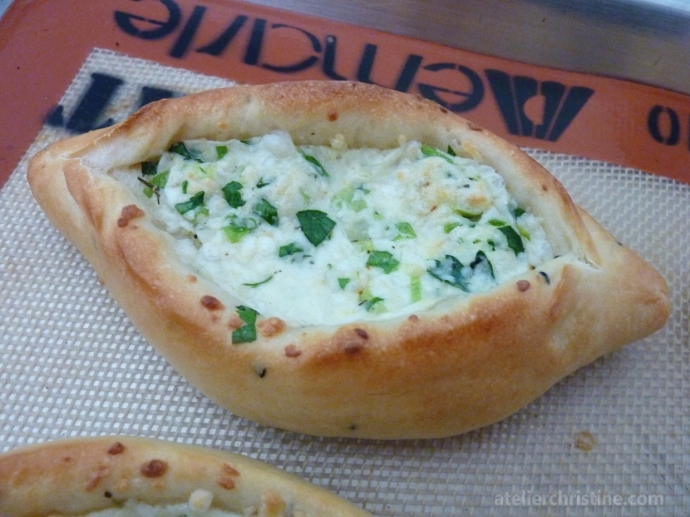 Fold the long sides over filling and pinch ends tightly to seal; creating a boat-like shape. Transfer onto a baking sheet covered with parchment paper or silpat. Cover with a piece of wax paper and slightly press to flatten edges; your assembled pastry should be about 5”x2 1/4” in size. Repeat until all pieces are shaped. Lightly brush with egg wash and set aside 20-to-25 minutes. Thank’s for sharing. I tried, it was very delicious.